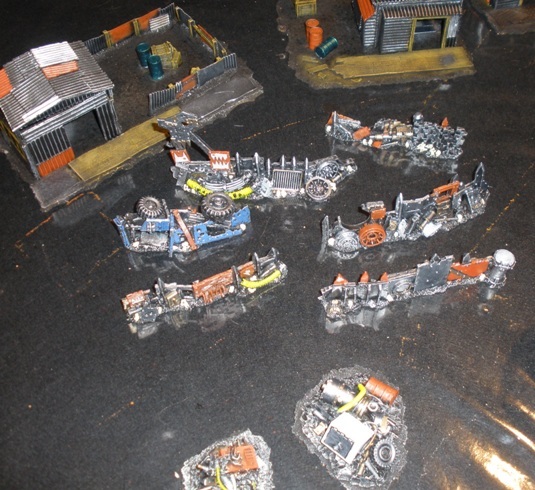 I then drybrushed the shacks, the scrap and the barricades with cheap silver acrylic from Lidl. 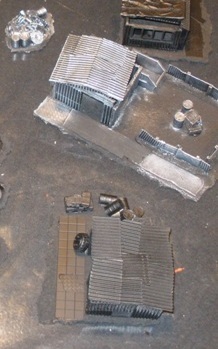 For a little variation I also entirely covered some of the sheets modeled onto the shacks etc in silver at this point. Two Pardulon shacks before and after a big silver dry/overbrush. Next I painted a random selection of elements on the pieces with a ruddy red oxide colour (which has become a recurring colour in this terrain set for an unknown reason). 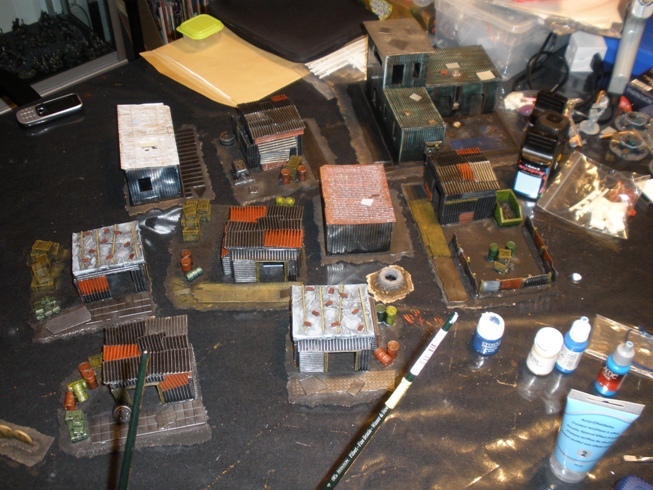 Lastly for this stage, I painted a number of details in suitable colours, such as the wooden doors, the tarp roofs on two of the shacks, tubing and other details on the barricades etc. While I wanted the end result to look ramshackle, I didnt want it to look too gaudy. Real junk and garbage obviously has a massive variation in colour. That would have been time consuming to paint and the end result may have looked… well… like garbage. So I used a limited palette on the lot. Generally speaking I stippled those colours on. I layered the colour on roughly in some cases and just used a base colour in others, whatever looked ok to me for each piece at that time. What I didnt really do was any significant highlighting. As I planned to lightly drybrush almost every thing with silver at a later point it wasnt worth while: the silver will provide the highlight. I planned to apply some appropriate transfers at this point, hoping that good usage of them would imply that elements of the shanty had been scavenged from items that previously had another use. As it happened I didnt apply any transfers. I had an afternoon set aside to do more work on the shanty and if I had put on transfers then I would have had to leave the whole lot to one side to dry overnight, so I decided to leave the transfers off. So the next step was to wash more or less everything with a mix of liquitex black ink, burnt sienna and water. This deadened the colours a bit, shaded some other areas and gave some definition. 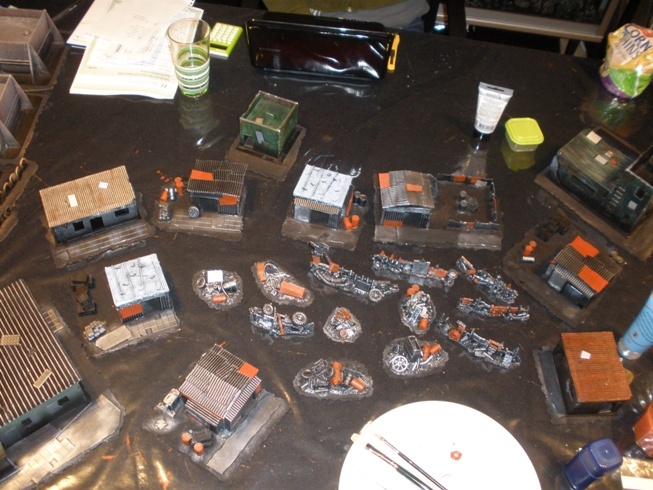 At this stage the wooden areas got a little attention with a combination of drybrushing, ink washes and all that. It was a bit freeform and done on a case by case basis, but was all simple stuff. After that most areas got a light of drybrush of silver. 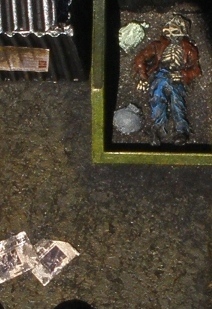 Some areas had some detail picked out if it had become too dull from the wash or if it rewarded a small bit of effort. Excellent, just excellent! Seems you’ve achieved a lot with not too much work. Maybe some bigger pictures, though? Seems you’ve achieved a lot with not too much work. 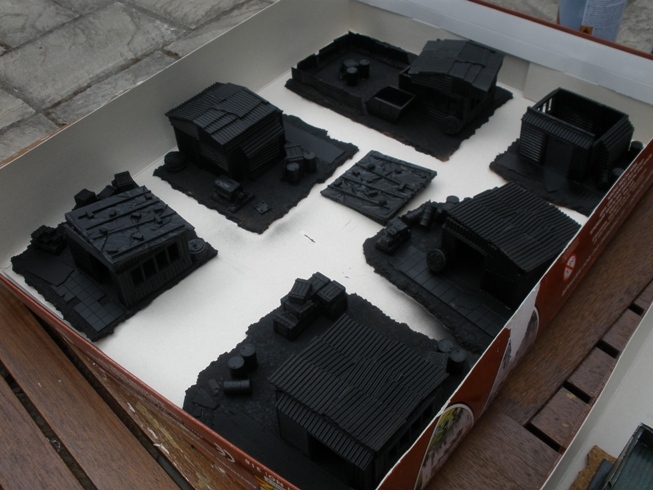 The precast resin Pardulon shacks went together like a dream with runny superglue being the most troublesome part. Having had the other six buildings both built and painted in advance makes the turnover look faster than it actually was. 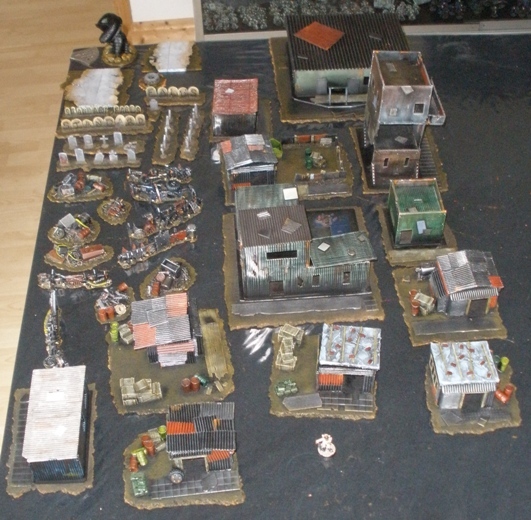 While those earlier made-in-1996 buildings are not very complex, they still took me a day or two to plan, cut out and assemble, plus the time taken painting them. Hot gluing buildings/junk piles/barriers to cork tiles and then breaking up the edges of the tile to fit was very rapid, much faster than doing the same with card or hardboard or similar. Aesthetically I like the broken up irregular edges too. But overall yes, it was fast. Considering the amount of gaming pieces generated it was quite a rapid process. 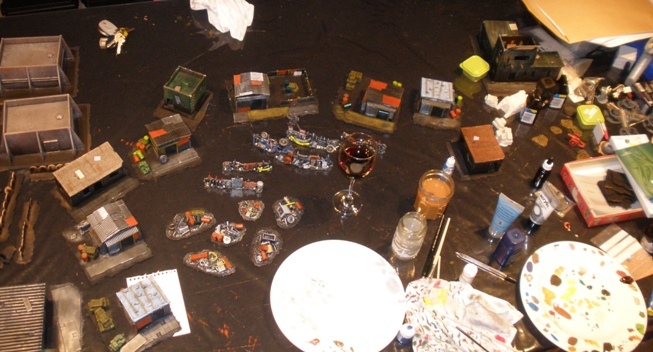 Like my miniature painting, my terrain making starts from a baseline of what is quick, adequate and feasible. While I have additional add-on plans for everything that I make, many of those ideas fall by the wayside for the sake of expediency. I would rather have a number of reasonably ok buildings than one heavily detailed, heavily worked one.